Turismo in Pianura - A brusa la Vecia! The burning of Befanas at the stake lights up the countryside around San Matteo della Decima (10 kilometres from San Giovanni in Persiceto) at sunset. 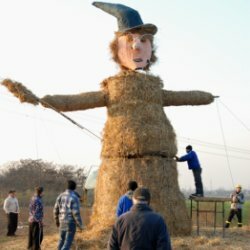 About 10-meter high straw puppets representing the “Vècia” (Befana in Bologna dialect) burn around the town in front of a crowd crying “A brùsa la Vècia” (Burn the Befana)! 7,30PM, via San Cristoforo 180, “Famiglia Lanzi”. 7PM, via Bevilacqua (famiglia Malaguti Pietro), “I piven ft. Dag dal gas”.